There may come a time when you decide it is time to up the ante with regards to your fitness training. Perhaps you have tried the ‘old school’ method of filling up your rucksack with books. It probably worked well until the bag tore! Besides, this tactic loads all the weight on your back. What you need is a piece of fitness equipment capable of distributing the weight evenly on your torso. As it happens, this perfectly describes the function of a weighted vest. A weighted vest for running is a vest made from a material such as vinyl which has little pockets that carry weight. The most popular type of vest is an adjustable one which enables you to add or subtract the weight as you see fit. As we mentioned above, the weights are placed on the back, shoulders, chest and stomach, so it is properly distributed around your upper body. As your fitness level improves, add more weight; it is as simple as that. 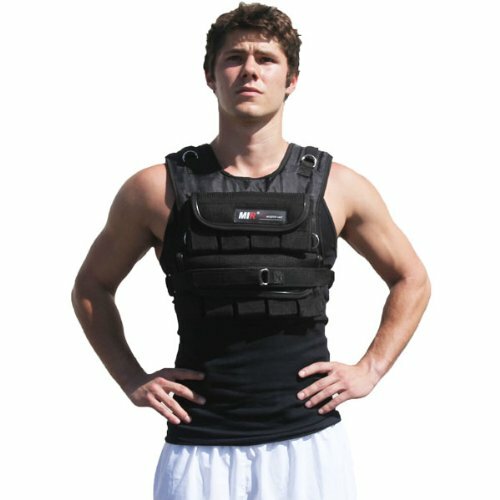 Why Would I Need A Weighted Vest for Running? The most obvious answer is to improve your overall performance. Here are some of the benefits of wearing a weighted vest for running. According to a commonly cited study involving the use of a weighted vest for running, wearing a vest that equals around 10 percent of your body weight during training sessions (and throughout the day) improves your performance. The study focused on participants that wore a vest for 4 weeks from morning to night and during their exercise sessions. At the end of the timeframe, the trainees that specialized in endurance displayed an improved ability to use oxygen while exercising. They were also able to run further before exhaustion. Their increased ability to use fast-twitch muscle fibers (for quick bursts of energy) helps explain their improvement. A recent study, published in 2012 in the Journal of Strength and Conditioning Research, discovered that wearing a weighted vest all day (but not during exercise), improved the agility of the participants who were all young, healthy and male. The men wore the vest 50 percent of the time for 4 weeks and showed improvements in agility. Also, running 4 times a week with a vest that weighs up to 10 percent of your body weight improves your ability to move quickly during sports like tennis, soccer, and basketball. Did you know that while a 125-pound individual running at 6mph burns 300 calories in 30 minutes, a 155-pound person running at the same speed and over the same distance will burn 375 calories? The simple reason is that the bigger the body, the more calories you burn when you run. A weighted vest is by far the best way to derive the benefit of extra calorie burn. Make sure you don’t wear a vest that is more than 10 percent of your bodyweight. For example, if you weigh 180 pounds, don’t choose a vest that is more than 18 pounds. Although the ZFOsports weighted vest is something of an all-rounder, it is ideal for those who want to add some extra weight when running. Regarding design, the vest looks fairly bulky, and you would be forgiven for thinking it is awkward to wear. In reality, it fits snugly and comfortably on the body, and it is easy to distribute weight evenly thanks to the adjustable nature of the vest. 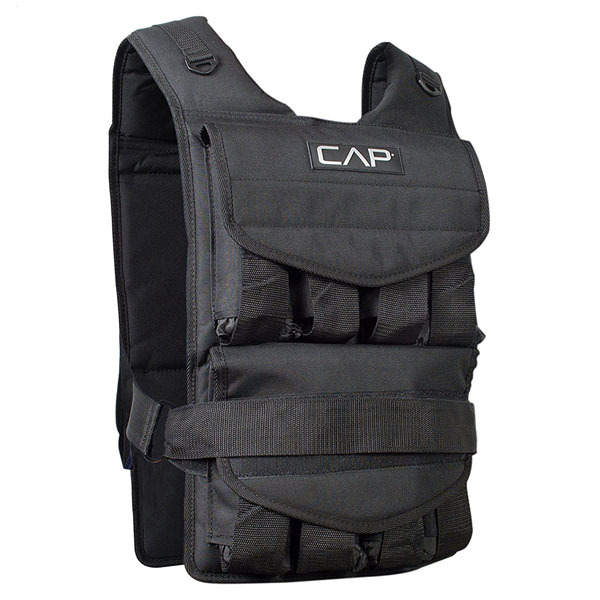 The vest has a maximum weight of 40 pounds, and it comes with all the weights you need. One slight downside is the fact you can only add 2.5-pound increments. Another possible issue is the ‘one size fits all’ nature of the vest. However, there is a handy Velcro belt system which allows you to tighten or loosen the belt as necessary. At around $73 including shipping, the ZFOsports is in the mid-range regarding cost but at the premium end of the scale when it comes to quality. The MIR adjustable weighted vest has a rather unusual design; it only fits halfway down your upper body which means the weight spreads across a smaller area than vests with a traditional design. However, it works extremely well as it is designed specifically for runners of all levels; ranging from casual joggers right the way through to long distance experts. Like the ZFOsports model, the MIR weighted vest has a Velcro strap to help you find the perfect fit, and you can adjust the weight in 3-pound increments to a maximum of 60 pounds. The vest comes with 50 pounds of weight. There are five individual straps so putting it on might take a little bit of patience! Although it is expensive at $180 including shipping, the MIR weighted vest is one of the best specialist runner’s vests on the market. There are three GoFit weighted vests to choose from with maximum capacities of 10, 20 and 40 pounds respectively. It is designed with runners in mind as the granulated steel pockets conform to the body for a comfortable fit. The vest is relatively short, so if you have a longer torso, you could even use it for weighted crunches. The neoprene padding enhances the comfort level, and its Double-closure design means it is ideal for men or women. There are a couple of issues; first of all, the adjustable straps have a tendency to wear out quickly. The major problem is that the GoFit weighted vest is not adjustable; so if you purchase the 20-pound vest, for example, you can’t increase or decrease the weight. Nonetheless, the comfortable fit and design make it well worth your consideration; not least if you are on a budget because it is available from just $39.99. A weighted vest for running is different to one for weight training. If you use a vest to help with resistance and bodyweight training, you can choose a looser version because you want freedom of movement. In contrast, a weighted vest for running must have a snug fit. The last thing you want is a vest that moves up, down and across as you jog or sprint. A loose vest also rubs against the skin which is uncomfortable and occasionally painful. Look for an adjustable weighted vest as it allows you to increase or decrease the weight depending on your level of fitness and goals. When running, you need the weight to be evenly distributed, or else it will negatively impact your performance. Take note of the weight increments too. Some vests allow you to increase the weight by as little as 0.5 pounds while others only allow a 2+ pounds rise. While 2 pounds might not sound like a lot, it makes the world of difference when you’re trying to run 3 miles. The price of weighted vests varies dramatically on Amazon.com so don’t rush into a purchase without thoroughly researching as many products as possible. An expensive vest may not be the best one for your needs. Now that you know it is possible to benefit from improvements to your cardiovascular system and VO2 max, it’s time to discover how to use weighted vests to your advantage. As we mentioned above, stick to no more than 10 percent of your bodyweight. Even 5 percent can result in tremendous improvements in agility, power, and endurance. This depends on your fitness level and training goals but in general, look to run on flat terrain and walk up steep hills. If you are training for speed and power, hill sprints are intense, brutal and very effective! Again, this depends on your goals. Someone training for a marathon over flat surfaces can use a weighted vest for practically every run barring ‘recovery’ runs. You can even use it on ‘rest’ days for walking or hiking as it is an effective form of active recovery. For High-Intensity Interval Training purposes, it is best to stick to 3 sessions a week. If you are hiking, leave the straps undone if possible. It reduces stability because the weights swing around; the result is increased core muscle engagement. If you are training for a race that involves steep climbs, try hiking over hills or on the treadmill at an incline with the vest to enhance the training effect. Don’t fall into the trap of assuming that weighted vests are just for strength training; they are excellent tools to improve your speed and endurance as well. If you are relatively fit but feel as if your training is stagnating, give it a much-needed shot in the arm by investing in a weighted vest for your running sessions.